Michael Lankford is the Director of Operations for Amanda Jewel Floral + Design, an organic inspired design studio located in Atlanta, Georgia. He is also a Startup Consultant, Business Coach, Management Analyst, and Realtor who enjoys helping creatives find success at all stages of business. I suppose I should introduce myself since I’m usually in the background of the creative world here at AJF+D. I am the director of operations for AJF+D, which means that I handle the stuff that bores most creatives to tears. I’m excited to share a little about me, what makes me tick, and unpack a few things I’ve learned along the way to save you some time and headaches. I was born in Decatur to an amazing mom with limitless love and a brilliant dad who was more business savvy than I could’ve understood. The result is a strange mix of someone who is driven to succeed in business, yet drawn to help others with the things I’ve learned. I discovered my passion for consulting while working as an engineer for a company where I was certified as an ISO auditor, project manager, and six sigma black belt. I eventually left that company and went back to school to get an MBA. After a venture of my own, helping launch a Fortune 500 company into Asia, and watching Amanda take her first steps as an entrepreneur, my love of startups was born. My original role in AJF+D was a general, unpaid laborer (I specialized in lifting heavy objects, sweating, bleeding, etc.). While I still do those things, my role has evolved into more of an in-house consultant and carpenter. In truth, I will always do all I can to support the dreams and success of everyone at AJF+D. Whether it is the task of listening without trying to fix, building some impossible contraption that is the object of a client’s dreams (a unicorn flying through a maple syrup waterfall, for example), or making suggestions as a business coach, I’m proud to be a part of this awesome journey that our AJF+D family is on. Many creative folks don’t share my love for business, and I understand. For many of the people I meet, much of what goes into a business leads to eye rolls, deep sighs, and yearnings to get back to the “pretty” things. Yet there are a number of big questions and serious things that must be addressed to maintain a sustainable business. I would like to share advice that is real. Practical insights you can read, understand, and apply to your business for real results. My one gripe with business advice in this industry is that a lot of it is fluff, based on a hunch, or seems to try and mirror the success of someone who spent years learning what truly goes into business strategy and planning. As entrepreneurs, time is too precious to spend listening to an hour-long webinar on something that can be shared in a few sentences. And money is too precious to invest in someone without credentials or experience who is more focused on their own bottom line (or followers) than yours. If you’re around me long enough, you’ll hear me say that our approach to business is to take care of the people in our lives with a sincerity that is real, relevant, and relational. If I can help one person stay motivated, to not give up, to keep chasing their dream, then this effort is worth it. So let’s get started! What do you want to learn? What are your biggest pain points? What are the questions and concerns that keep you up at night? How can I help you move from where you are to where you want to be? Comment below or shoot me an email at ml@amandajewel.com. A palette of soft pinks, blush and shades of orange embodies the softness and romance of the spring season. Watercolor details and blush gowns make this perfect for spring. We partnered up with some amazing vendors to make this spring inspiration shoot come to life. Hope you enjoy! Featured on Aisle Perfect Blog. This ombre flower arrangement is one of our favorite parts of this inspiration shoot. Soft colors that blend together to create a breathtaking centerpiece that is truly unique. As simple as it sounds, flowers really do make people happy and it is therapeutic when you get to work with your hands and design something beautiful. 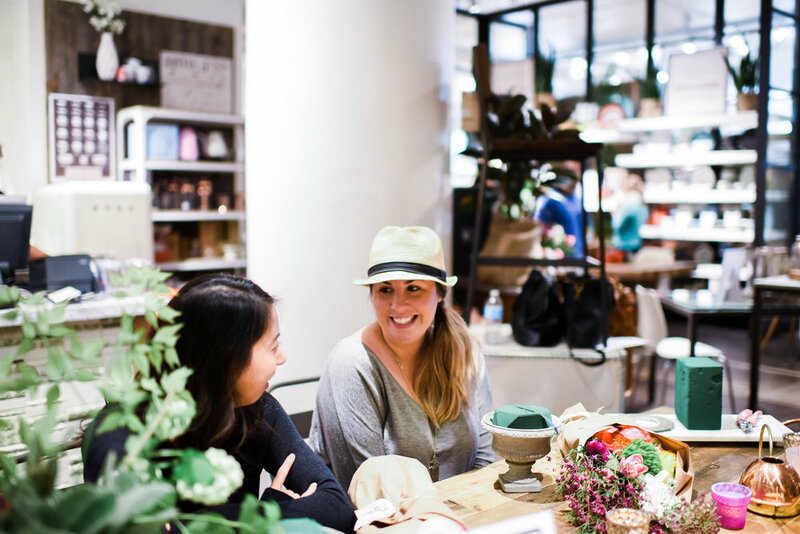 One of my dreams in this floral life is to teach and West Elm gave us that opportunity. We are so pleased to share images from our most recent workshop where we taught some aspiring ladies how to make a floral arrangement with all my favorite flowers. These gals really have some talent! We had the pleasure of having Holly Von Lanken capture the workshop, so please enjoy the images below and make sure you head over to her website to be amazed. We have many more workshops headed your way so be sure to follow our IG handle at @amandajewelfloraldesign to be the first to know. We have limited seating and our workshops fill up fast! Visit our Workshops Tab too.